We kicked off this series with the why, how and what of Data Trust, by Design. Before continuing, it’s worth going back to that post and reading or re-reading. It’ll make the contents of this post more applicable. Why does data trust matter? The world of data is changing really quickly. There are behavioural, regulatory and technological forces impacting this change. Basically we could end up going one of two ways. We could go down the Black Mirror, or maybe even Minority Report route, or we could go down a route that appears to be a bit more utopian — a future that is inherently human centric. This doesn’t mean no sharing of data. That couldn’t be further from the truth. What it means is a more balanced, trust-based ecosystem for data sharing and more importantly, data-driven value exchanges. This won’t happen through some chance encounter. This future needs to be designed. How can data trust and DTbD help us achieve this? If people have a high propensity to willingly share their data, if organisations are incentivised to process data ethically, and if an entire ecosystem is optimised for individual, communal and societal outcomes, data can become a ‘thing’ that positively impacts us all. The job of DTbD principles, patterns and practices is to help make this a reality we can all contribute to. In simple terms Data Trust is the trust a person places in an organisation’s data practices. Data trust has been earned when people have a high propensity to willingly share their data. As we now know, this is not the case today. DTbD is the practice of designing transparent, positive-sum, value-generating experiences that give people the ability to make free and easy choices about how their data is and isn’t used. And here are the 6 principles. In our introductory post we mentioned that we’d be progressively communicating some of the design patterns we were working on. This post is about the first of those patterns; upfront terms and conditions. 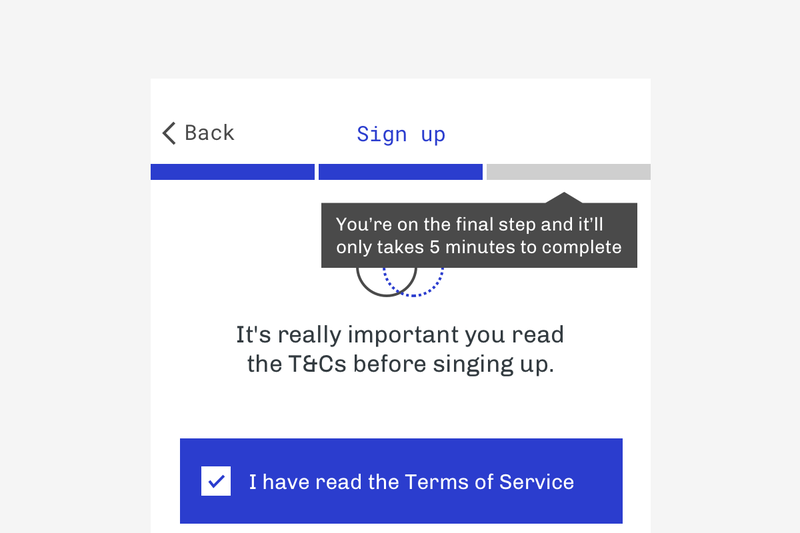 Right now it’s clear the status quo design pattern relied upon for upfront T&Cs is broken. People really don’t know and are often unhappy with what they’re signing up to. With the advent of regulations like the GDPR and the extension of rights that brings to citizens, hideaway terms and conditions will have to become a thing of the past. We will collectively need to find a better model. Please don’t think I’m picking on this particular sign up flow. I haven’t critiqued it. I don’t have any data that supports its efficacy or lack thereof. In fact, at a glance it looks pretty solid. It appears to have been designed in such a way that the least number of actions required to decrease Time to Value (TtV) are right there waiting for me to complete at the point of time I’m most motivated to complete them. It’s solid design output. 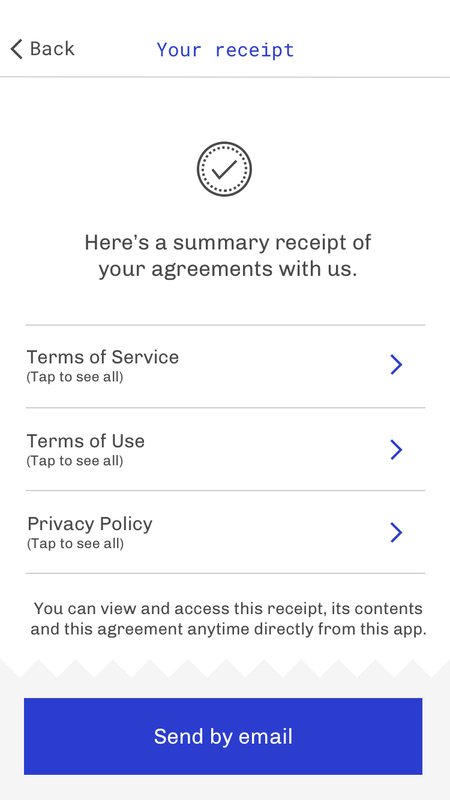 And this isn’t unique — it’s the current design pattern for terms and conditions. It’s followed by a mountain of legalese that’s incomprehensible for most people. These types of patterns do not inspire data trust. To earn data trust we must be radically transparent. We must deliver the value we promised we would. Then, throughout the course of the relationship our organisation has with a person we need to show we’re willing to own the consequences of our actions. If we screw up we need to mitigate the risk, communicate the impact and demonstrate what we’ve learned and how it’s made us better and our customers safer. Equifax is a brilliant example of what not to do in this type of situation. The more recent debacle that cost Facebook about $58 billion in a week, and plenty more the week later, also highlights this. All of this thinking underpins the type of work we currently do with clients. And it’s exactly why something like terms and conditions, which has never really been ‘designed’ before must now be brought to the forefront. These types of functions must become part of our proposition. If right now you’re thinking, “this dude is bonkers, no one even cares,” then you’d be partially correct. 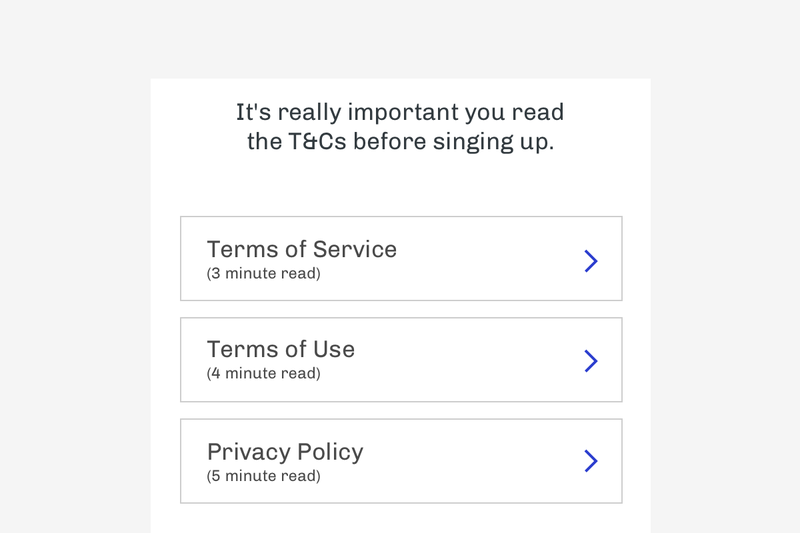 What we’ve come to learn is that a high proportion of people will only engage with things like terms and conditions at the very highest level. This seems to be largely the result of learned behaviour, but it is the state of play nonetheless. Even though this is the case it doesn’t mean we can’t consciously design empowering experiences that cater to different risk profiles, learning types and situational contexts. We should be motivated to inform, empower and enable the people we serve as customers to make choices about how they engage with our products and services. Zero sum isn’t the future. So, without further adieu, here’s what we’re currently working on. This is a very high level, static view of the experience, so let’s look a little closer at the function and purpose of each core component. If you’ve read our playbook you’ll know we’re big on leading with values. We think values inform purpose and intent, purpose informs culture and organisational design, culture and organisational design enable workflows and practices, and from there, workflows and practices produce outputs in the form of products, services and business models. Leading with data values or some form of promise does a decent job of communicating intent and purpose in a way people actually ‘get’. It’s the first notion of transparency and thanks to the work we’ve been doing, now believe it’s a great starting point for establishing a new data relationship. But it’s just a start. Don’t over value it. What matters is what you do next, and the day after and the day after that. We’re not here to act as your legal advisors. Seriously, none of this constitutes anything close to legal advice. Work with lawyers and data protection practitioners early and often. No exceptions when it comes to data driven initiatives. There’s a * here because contextual guidance isn’t limited to one specific part of the experience. Right now, things like the GDPR are set to break some existing organisational practices. This is likely to result in new patterns surfacing themselves to people. Are we expecting them to just get it, or do we think there’s an opportunity to offer assistance? Our thinking aligns to the latter. We’ve come to learn that people’s first reaction to a new pattern isn’t always positive. Anything that causes someone to flip from autopilot to thinking mode can induce friction. Our objective with this type of contextual guidance is to provide the simplest, least intrusive form of guidance that supports someone in taking an affirmative action as their next step. It might go without saying, but the way contextual guidance surfaces in an experience is dependent on a variety of factors from brand, to product, to reliance on data, to stage of the relationship. No one size fits all here. We take insights from our work and do our absolute best to contextualise what we learn in our daily practice to the commercial projects we work on. Just like our entire DTbD scope of work, this is a work in progress. Our limbic brain literally throws a hit of Dopamine our way when we cross off a task from our to do list. Completing stuff feels good. In fact, giving people visibility of the tangible progress they’re making towards a specific outcome increases the likelihood they’ll keep going. We want that Dopamine hit! Neuroscientists refer to this as “self directed learning”. This pattern has been embedded into most onboarding experiences that have been designed over the last few years. It’s not new to design, but it is new to the design of upfront terms and conditions. We’re experimenting with different ways we can surface this at the moment. As with most of the components of the pattern/s we’re proposing, the implementation will be context sensitive. If an agreement has a number of components, whether that be separate agreements, a request for many different data attributes, the proposal of different processing purposes or something else entirely, the core idea of the EU’s evolving regulatory environment is that people should understand what they’re getting into and make a choice about what they may or may not be comfortable with. It’s really about defining shared objectives, making the purpose clear, establishing a relationship as equals and earning each other’s trust over a period of time. In fact, this model of data sharing more closely represents real life human relationships. We believe there is a way to balance engaging at each level with the expectation of a valuable, meaningful and engaging experience. It’s a tough balance to strike, but we’re working on it by catering to different learning types, different risk profiles and different situational contexts. We’re constantly questioning whether layering is the most effective approach. Some of the work we’ve done using this pattern has been extremely effective. Other approaches like video and visualisations have also proven effective. The approach you take will likely depend on your point of view, your design system and of course the form factor or platform people are engaging with. Just keep in mind the objective; to maximise the likelihood people engaging in the experience actually achieve comprehension and eventually make a real choice. You want to inform, empower and enable the people you serve to make choices. We’ve got some key questions surrounding how long this is necessary. 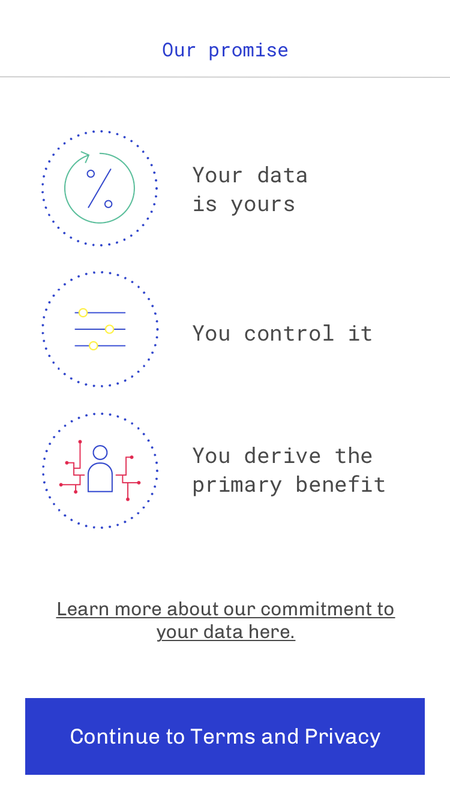 As in, if the environment in which data is used becomes inherently trustworthy, or we have personalised assistants doing stuff for us, will engaging this way be relevant? Right now that’s an unknown. For now though we need to balance the value expectations people have with the limitations of organisations and the regulatory environment they will soon operate it. This will actually be released as its own design pattern, however it’s worth touching on right now. 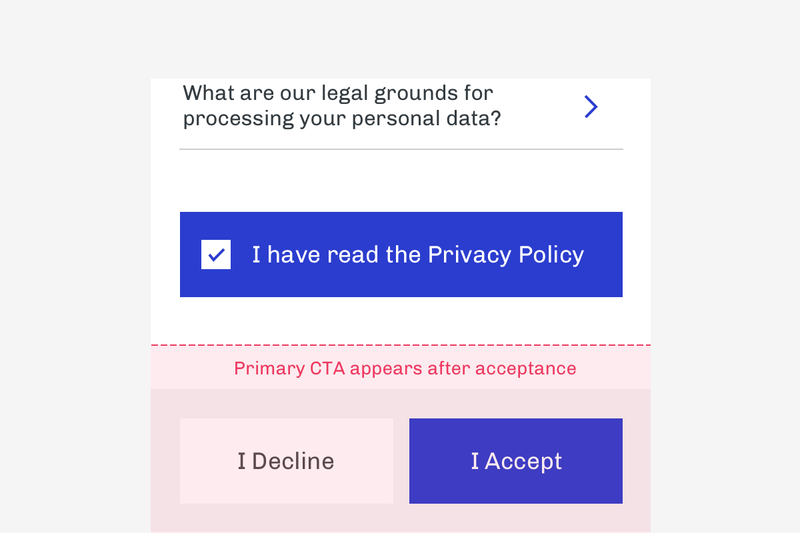 Given people will likely have the ability to accept or decline up front terms and conditions, and consent can’t be a precondition (although there are other ways to legitimise processing activities, so speak to your legal representatives), declining the terms might not necessarily mean someone can’t continue. We believe people should be able to continue, and as we’ll reference below, already advocate progressive disclosure to the clients we work with. Consequence clarification, in this context, is about helping the person to understand how the proposition we promised to deliver them might be impacted. For instance, if the proposition is inherently data driven and relies on analysing some data to produce an insight, then not analysing the data might render the application fairly useless. Even though this is the case we shouldn’t halt someone’s progress. We should let them progress, navigate on their own terms and give them the opportunity to progressively share with us as we further develop our relationship. This is not something unique to Greater Than X. There is a even a consent receipt standard being developed, which has already been implemented by Digi.me and Consentua. The idea is that the person agreeing to something gets a simple summary they always have access to. In fact, from this summary they should be able to dynamically engage with what they’ve signed up to. 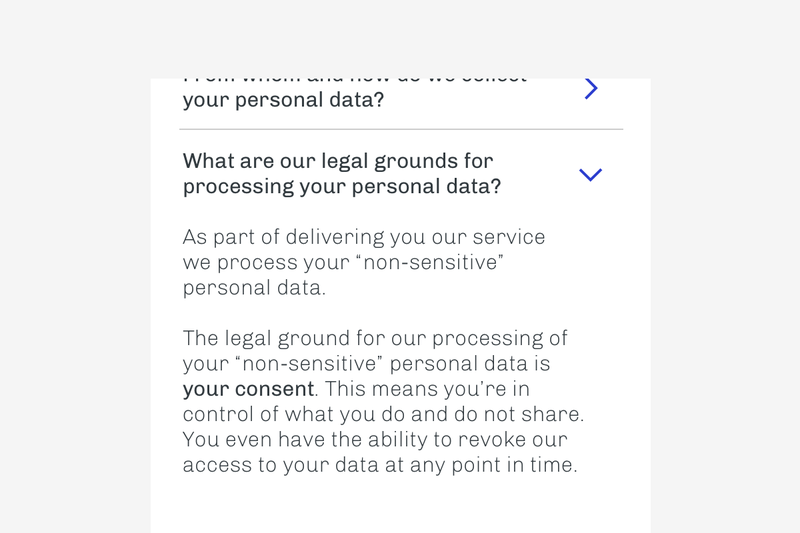 In the context of consent this might mean revoking access to certain data feeds. In the context of up front T&Cs this might mean something different entirely. In the spirit of transparency, we’re yet to decide whether we will release a standalone design pattern for data sharing or consent receipts. Lots of work is being done on this so we’ll progressively assess the value of us further contributing to the pattern and make a decision over the coming months. There’s lots more I could detail in terms of the work that’s gone into what you see here. That would be a seriously long post. We’d actually like you to spend time with the people you care about today. Onwards! How do we define valuable versus ‘value less’ friction? Text heaviness currently burdens the T&Cs landscape. How can we work towards simpler, more visual mechanisms that support the same outcomes (understanding, choice, ability to dynamically engage and exercise rights etc.)? If legalese remains the primary communication method of up front terms and conditions, how do we synthesise a clause or entire agreement in such a way it’s comprehensible (something that cross-functional collaboration is making a little easier for us anyway)? Who actually owns this initiative? It differs by organisation at present. What if design owned it? With the support of other departments and key stakeholders, what impact might this have? The personal or team leading this initiative needs to grapple with desirability, viability and feasibility considerations. We’re actually starting to see new roles emerge to lead core aspects of customer data strategy and implementation. How long will it take for new patterns to become broadly accepted? What number of interactions with radically transparent data practices does one have to have before that level of transparency and control become a basic expectation? What we’ve proposed above isn’t a one size fits all design pattern. It’s a work in progress and as we know, there are many ways to peel a carrot! What we hope is that this serves as a frame of reference and point of inspiration. We hope it challenges you to think differently about informing, empowering and designing experiences that enable the people you serve as customer’s to make free and easy choices about how their data is and isn’t used. In fact, we very much hope this type of thinking catapults you along the pathway towards data trust. Before signing off I’d like to say a special thanks to James Harvey for working closely with me on this. Stay tuned. There’s plenty more to come.